A lock-out pin not removed after maintenance meant the crew of an Airbus A320 landed at Sydney with reverse thrust inadvertently deactivated. An ATSB investigation found a maintenance team had deviated from procedures, probably due to operational pressure. Prior to the 20 September 2018 incident, the aircraft had undergone a three-day maintenance check at a facility in Brisbane, Australia. Two days in, the engineers identified that the horizontal stabiliser actuator required replacement, which added a half day of work to the schedule. To recover the lost time, the team was organised to begin work at 04:00 the following day. Then the aircraft departure time was brought forward, and the engineers were instructed to complete the maintenance by the end of first shift. Many of the engineers worked through their lunch breaks to ensure they could complete the maintenance on time. While working under the compressed schedule, engineers deviated from the written procedures, and the incorrect lockout pin was installed and then not removed later. As a result, the aircraft was returned to service with the thrust reverser system inadvertently deactivated. There was no damage to the aircraft, or injuries as result of the incident. The ATSB states that the safety message from this investigation is that functional checks are the last line of defence in maintenance work. Failure to follow procedures, such as functional checks, can result in unintended consequences. Additionally, it is imperative that aircraft maintenance engineers feel empowered to stop a process when they observe procedural violations or foresee that an error is likely to occur. The U.S. National Transportation Safety Board (NTSB) determined that a pilot’s failure to perform a go-around when the approach became unstable, which resulted in a stall at low altitude, caused the May 15, 2017, crash of a Learjet 35 jet near Teterboro Airport, New Jersey, USA. After departing controlled flight during a circle-to-land maneuver to the airport, the Learjet 35A crashed into a commercial building and parking lot, about a half mile from the intended runway. Both pilots, the only occupants aboard the aircraft, died in the crash. In addition to failing to go around when the approach became unstabilized, the crew committed multiple errors, and repeatedly failed to comply with the operator’s standard operating procedures before and throughout the flight. The NTSB determined the pilot-in-command’s preflight planning was inadequate. His flight plan contained an incompatible altitude for the planned 28-minute flight from Philadelphia to Teterboro. He also failed to secure weather information for the flight leg despite the company’s policy to do so within three hours of the flight. Throughout the majority of the flight, the second-in-command was the pilot flying the airplane although he did not have the experience necessary to do so according to the company’s standard operating procedures. The pilot-in-command coached him extensively, interfering with his own pilot monitoring duties. On approach, the crew failed to conduct the required approach briefing or complete any checklist, which would have reduced their workload and provided them with a shared understanding of how the approach should be flown. This resulted in the pilots’ confusion and led to mismanaging the approach and not initiating a circle-to-land maneuver when instructed by air traffic control. The NTSB report notes that although deficiencies were noted during the pilots’ initial training, the company did not monitor their subsequent performance to identify and correct continued deficiencies. The operator’s lack of safety programs that would have enabled the company to identify and correct patterns of poor performance and procedural noncompliance was a contributing factor in the crash. Review Learjet operators’ manuals to determine whether they contain manufacturer-recommended approach speed wind additives and encourage those operators without that information to add it to their operations documents. The MD-83 runway excursion accident at Detroit-Willow Run Airport in March 2017, occurred because of an undetected mechanical malfunction in the elevator, the National Transportation Safety Board says. Seconds after reaching the takeoff decision airspeed of 158 mph at about 5,000 feet down the 7,500-foot runway, the captain’s attempt to raise the nose and get the plane airborne was unsuccessful and he decided to reject the takeoff. The airplane decelerated but was traveling too fast to be stopped on the remaining runway. 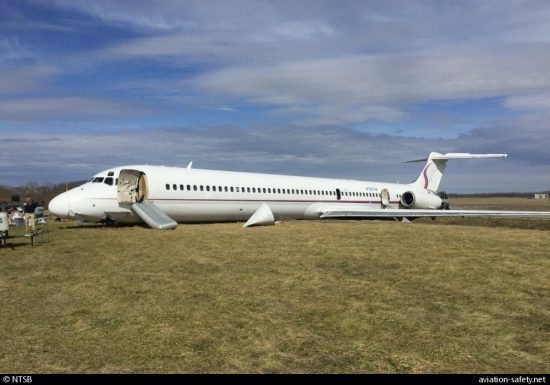 It departed the end of the runway at about 115 mph, traveled 950 feet across a runway safety area, struck an airport fence and came to a rest after crossing a paved road. Investigators determined that a component of the elevator flight control system had jammed in the days before the accident flight while the aircraft was parked at the airport during a wind storm with recorded gusts in excess of 60 mph. Although the flight control system was designed and certified to withstand such horizontal gusts, computer simulation of the wind flow showed that a nearby hangar generated localized turbulence with a vertical component that could move the elevator rapidly up and down, ultimately causing it to jam.. The flight crew completed all preflight checks, including a test of the flight controls, and found no anomalies before initiating the takeoff roll on the accident flight. The NTSB said that there was no way that the pilots could have detected the flight control jam until it was too late. Investigators said that the captain’s quick decision to abort the takeoff and the other crewmember’s coordinated efforts to assist him had likely contributed to the survivability of an accident in which there were no serious injuries among the 110 passengers and six crewmembers. The Ameristar MD-83, which was transporting the University of Michigan basketball team to Washington, D.C., was substantially damaged. The NTSB also noted that the 1,000-foot runway safety area, added during upgrades between 2006 and 2009, likely contributed to the lack of serious injuries.